Having a breakout area, or as we like to call in the industry a ‘third space’ is becoming increasingly popular throughout the UK, and indeed around the world. It’s because the concept of the breakout area has evolved to become much more than merely soft seating in the corner of an office or a small, dated canteen. Below, we discuss some of the key benefits for both workers and employers that occur if you create an office breakout space in your workplace. During the busy working day, it’s easy to forget that employees need to take some time out to be at their most alert and productive. Even 20 minutes at lunchtime can make a big difference. While you may think that where your employees eat their lunch doesn’t directly impact the quality of their work, it does have an impact on their overall wellbeing, engagement and ultimately productivity. By providing a nice breakout space away from the stress and noise of the main office, employees are able to reflect on tasks and think clearly. The breakout space will encourage relaxation and social interaction; meaning employees arrive back at their desks feeling revived, refreshed and ready to do their best work. Some of the best ideas come from impromptu conversations and discussions, and a breakout space is the perfect example of this. Office breakout spaces support interaction with colleagues socially and encourage ideas to be generated and shared in a more relax space. No one can produce their best work if they are stressed or haven’t had time to rest and recharge. Siting for long periods of time at a desk is not only bad for your health, it can be mentally exhausting. Lunch time is the perfect time to demonstrate to staff that you take their wellbeing seriously, by encouraging breaks and providing a nice breakout area to relax, you can create a culture where lunch breaks are seen as a vital part of the working day. Happy, refreshed staff are healthier, less stressed and also tend to feel more valued if they are taken care of. 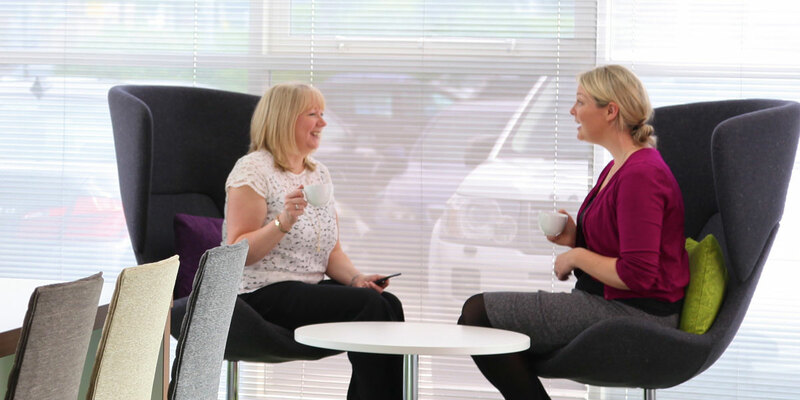 The great thing about having a breakout area such as a ‘workcafe’ is that it can also be utilised outside of lunch ours as an alternative work or meeting space. By using it in this way – the office space is being used to its full potential all the way throughout the day, not just during lunch time. You could try taking inspiration from the trend of bringing home comforts into the office, to show your staff that they don’t need to leave the office to switch off. Look to bring in big cosy rugs, warm lighting and furniture made of natural wood – The Love Chair and Sofa are perfect for this type of environment. When people are relaxed, they are comfortable and encouraged to share ideas. Your office space says a lot about your company – and it should make people feel excited at the prospect of coming to work for you. If you work in a competitive industry, attracting and retaining the best talents is crucial if you are going to stay ahead of your competition, and the design of your office workspace could give you an advantage. Creating a variety of spaces for your staff to work and relax within the office could result in you not only keeping hold of your best workers, but also encourage new talent from elsewhere. We need to keep moving to keep healthy. Introducing a breakout space in the workplace encourages staff to get up and move away from their desk. The human body wasn’t designed to sit in front of a screen for nine hours a day, so it’s no surprise that so many of us suffer with aches and pains. A separate office breakout area gets employees up from their desk, moving around and provides the opportunity to change their posture during the day. Moving around during the working day reduces mental blocks, boosts concentration, causes the heart to beat faster (burning more calories) and reduces the risk of diabetes and heart disease. If you are considering a new office breakout area, why not give us a call and discuss your requirements with one of our experts.